If you haven't seen the news today it looks like Anthony Weiner's (ex?) wife is considering taking him back...AGAIN. This guy is like a modern day Rocky. Guy gets knocked down has his life ruined several times, and bounces back every time. And the thing is he deserves it! Dude seems like a totally chill guy, except when it comes to having an HD camera in his hands (pants) ready to fire off at all times. Less than five years ago this man was climbing the political latter at rapid speed in the United States. He was on the fast track to become a top tier politician...maybe even a run for the White House someday. Okay, I'm stretching it, but the dude was rolling. And again....you can't blame the dude. This could have happened to anyone. But it happened to him. 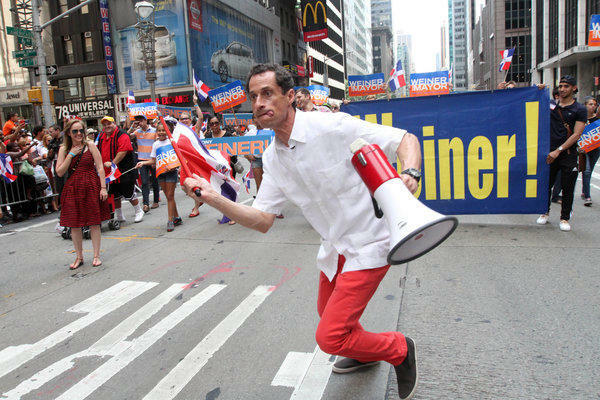 Anthony WEINER. And if you think this guys ego stops at sexting...WRONG. He had a camera crew follow him around New York for a few years and make one of last years best documentaries. Here's one tip for Mr Weiner. Dude, get rid of the data plan. Nobody likes big phone bills, or apparently your big "bill".